From the middle East (Syria, Lebanon) this hop flowered species of Origanum has been a stalwart performer in our climate. 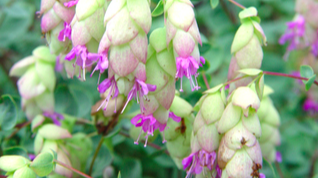 Low and spreading stems create hop shaped structures that house the little protruding hot pink flowers. The hops are mostly light green but can take on pink tints. 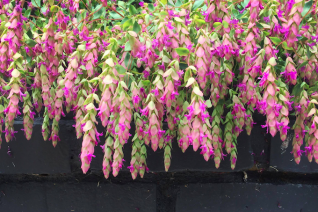 They are fully pendulous and the best way to display this plant is to site it on the edge of a precipice or wall or from the side of a container. To 8″ tall and 2′ wide when happy. Rich, well drained soil with light summer water. Begins blooming in May and continues unabated to September. One of the parents of several popular hybrids but we like the straight species quite a bit- it seems tougher. Graceful. Dies to a very low mound of foliage in winter. Cut back the previous seasons dead stems in early spring. Cold hardy and very showy. Unusual hybrid that has created some striking effects for an ornamental oregano. 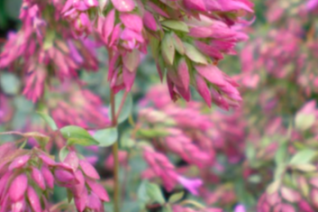 Distinctly upright stems to 2′ tall, beginning in June groups of up and outwards facing pink small hope like structures bear tiny violet pink flowers. Bloom goes on virtually for months and even when officially done these “hops” remain and change to a deep madder red. A large plant with dozens of upright stems bearing these remnants of flowers is really cool. Full sun and rich, well drained soil. Consistent light watering. Detach the whole stem from the base as a long lasting unusual cut flower. Dies to a low rosette of leaves in winter. Cut back the dead remaining upright stems in spring. Cold hardy. Photo credit: Grace Peterson- thanks Grace. A chance hybrid announced itself in our nursery with these insanely long hop flowered blooms. A low spreading perennial with distinctively blue foliage. In summer many, many stems emerge bearing clusters of flowers. They are shaped like long skinny hop fruits with tiny violet flowers that protrude through the layers of the hop structure. That structure is remarkable. Taking on purple and blue tints it begins to elongate and doesn’t stop until its fully 4″ long. They come in multitudes- this plant lives to bloom. Full sun and rich, well drained soil with light summer water. To 1′ tall and 2 wide in a season. The floral display goes on well into fall. Place near a wall where it will happily cascade. Excellent in large containers. Hardy and easy to grow. Cut back old material in early spring. A new low batch of foliage will already be present.